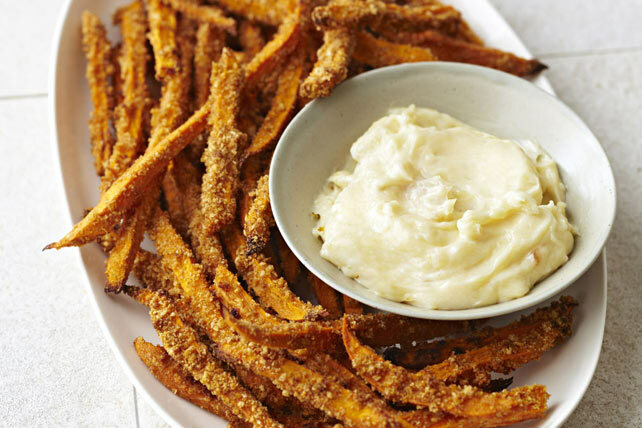 Baked sweet potato fries are great on their own, but these crunchy bites are taken to another level when served with garlicky mayonnaise. Cut 1/4-inch-thick slice off top of garlic; discard. Place garlic, cut-side up, on 6-inch-square piece of foil; drizzle with 1 tsp. oil. Wrap garlic in foil. Cover 2 rimmed baking sheets with additional foil; drizzle evenly with remaining oil. Cut potatoes lengthwise into 1/4-inch-thick matchlike sticks. Whisk egg in large bowl. Add potatoes; toss to coat. Add, in batches, to coating mix in separate bowl; toss to coat. Spread evenly onto prepared baking sheets. Bake potatoes and garlic 25 to 35 min. or until potatoes are crisp-tender and golden brown, turning potatoes every 10 min. Cool 2 min. Unwrap garlic; carefully squeeze garlic cloves into small bowl. Add mayo; mix well. Serve with potatoes. For more kick, whisk 1/2 tsp. ground red pepper (cayenne) with the egg before using to coat potatoes as directed. Prepare using KRAFT Mayo with Olive Oil Reduced Fat Mayonnaise.